This table folds down from behind the curtain and can slide towards the kitchen for additional counter space or towards the tv area for an office space. The room is guest-ready for some nice entertaining! Loving the dark wood floors and exposed brick wall too! Loving the functional office space! The murphy bed - hidden during the day behind the curtain - folds down for a peaceful nights sleep. Most of us small space dwellers know about reusing rooms for the function at hand. Dining table one minute, office the next. 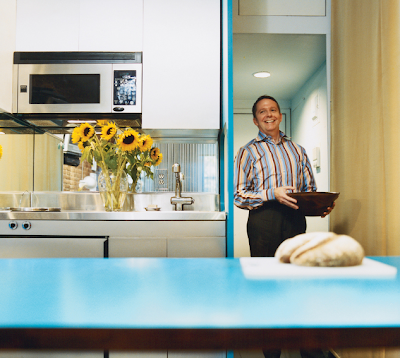 In Dwell's article, we meet Milan Hughston, New Yorker and 1-room studio dweller. Along with architect Joel Sanders and some innovative curtain / slide systems, the studio space actually has the ability to become multiple different rooms - literately. Based on his idea of "Curtain Wars", Sanders perspective for the textile is that “the iconic modernist façade which has come to embody all the values of modern architecture—logic, structural integrity, and stripped-down form—takes its name from the curtain, the signature element of the interior decorator.” With that integrity strongly in place, Hughston's curtain lined space has the ability to function as an office, a family room, a kitchen with counter space, a dining room and more. And it's not just function, emotion plays a kind and interesting role as Hughston describes, "The physical act of sliding open a curtain is somehow more peaceful than opening and shutting closet doors." With more people learning and appreciating the love and ease of small space dwelling, this interesting article hits a lot of points discussed on this blog. Form and funtion easily meets appreciation and enjoyment of your (small) space. Click here to enjoy the entire article and slide show.